Vehicle autonomy and driver assistance systems rely on a combination of a balanced mix of technologies: RADAR (RAdio Detection And Ranging), LiDAR (LIght Detection And Ranging), cameras and V2X (vehicle -to-everything) communications. These technologies often have overlapping capabilities, but each has its own strengths and limitations. RADAR has been used in automotive for decades and can determine the velocity, range and angle of objects. It is computationally lighter than other sensor technologies and can work in almost all environmental conditions. RADAR sensors can be classified per their operating distance ranges: Short Range Radar (SRR) 0.2 to 30m range, Medium Range Radar (MRR) in the 30-80m range and Long Range Radar (LRR) 80m to more than 200m range. Long Range Radar (LRR) is the defacto sensor used in Adaptive Cruise Control (ACC) and highway Automatic Emergency Braking Systems (AEBS). Currently deployed systems using only LRR for ACC and AEBS have limitations and might not react correctly to certain conditions, such as a car cutting in front of your vehicle, detecting thin profile vehicles such as motorcycles being staggered in a lane and setting distance based on the wrong vehicle due to the curvature of the road. To overcome the limitations in these examples, a radar sensor could be paired with a camera sensor in the vehicle to provide additional context to the detection. LiDAR sensors measure the distance to an object by calculating the time taken by a pulse of light to travel to an object and back to the sensor. Placed atop a vehicle, LiDAR can provide a 360° 3D view of the obstacles that a vehicle should avoid. Because of this capability, LiDAR has been the darling of autonomous driving since the 2007 DARPA Autonomous Driving Challenge. Since then, LiDAR sensors have had great size and cost reductions, but some of the more widely used and recognized models still cost a lot more than radar or camera sensors, and some even cost more than the vehicle they are mounted on. LiDAR in automotive systems typically use 905nm wavelength that can provide up to 200m range in restricted FOVs and some companies are now marketing 1550nm LiDAR with longer range and higher accuracy. It is important to note that LiDAR requires optical filters to remove sensitivity to ambient light and to prevent spoofing from other LiDARs. It is also important to note that the laser technology used has to be “eye-safe”. More recently the move has been to replace mechanical scanning LiDAR, that physically rotate the laser and receiver assembly to collect data over an area that spans up to 360° with Solid State LiDAR (SSL) that have no moving parts and are therefore more reliable especially in an automotive environment for long term reliability. SSLs currently have lower field-of-view (FOV) coverage but their lower cost provides the possibility of using multiple sensors to cover a larger area. Cameras: Unlike LiDAR and RADAR, most automotive cameras are passive systems. The camera sensor technology and resolution play a very large role in the capabilities. Cameras, similar to the human eye, are susceptible to adverse weather conditions and variations in lighting. But cameras are the only sensor technology that can capture texture, color and contrast information and the high level of detail captured by cameras allow them to be the leading technology for classification. These features, combined with the ever-increasing pixel resolution and the low-price point, make camera sensors indispensable and volume leader for ADAS and Autonomous systems. Adaptive Cruise Control (ACC): currently consistently detect full-width vehicles like cars and trucks, these need to be able to classify a motorcycle and keep distance. Automatic High Beam Control (AHBC): currently do high-low beam switching and need to evolve to be able to detect oncoming vehicle(s) and contour the ray of light accordingly. Traffic Sign Recognition (TSR): current systems recognize speed limits and various limited subset of signs. Future systems need to understand supplemental signs and context, (Speed limit in effect 10am to 8pm”) detect traffic signals to adapt ACC , stop, slow down etc. Lane Keep Systems (LKS): currently detect lane markings, future systems need to detect drivable surface, adapt to construction signs and multiple lane markings. Inside the cabin, driver monitoring and occupancy tracking for safety is being joined by gesture recognition and touchless controls. Including adding context to the gesture recognition based on gaze tracking. And for AV systems driver monitoring takes on the added use of checking if the driver is prepared to re-take control if needed. Beyond sensor-based radar, LIDAR, and camera technologies, true autonomy will require the vehicle to communicate in a multi-agent real-time environment. This is where vehicle-to-everything (V2X) communications comes in. V2X allows you to “see” even further than what’s nearby, around curves, around other vehicles, through the dense urban environment, and even up to a mile away. With V2X (vehicle-to-everything) communications, cars can “talk” to other cars, motorcycles, emergency vehicles, traffic lights, digital road signs, and pedestrians, even if they are not directly within the car’s direct line-of-sight. As two or more things enabled with V2X come into range, they form an ad-hoc wireless network that allows them to automatically transmit and send real-time short, dedicated safety-critical messages to each other. All four technologies have their strengths. To guarantee safety on the road, we need redundancy in the sensor technologies being used. 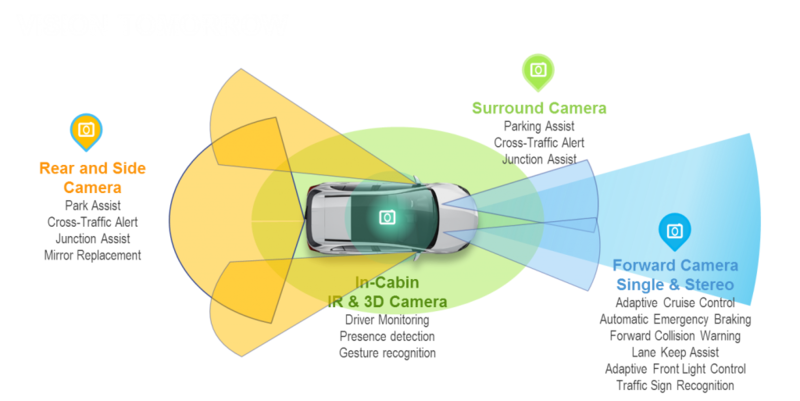 Camera systems provide the most application coverage and color and texture information so camera sensor counts in vehicles are projected to see the largest volume growth close to 400 million units by 2030. While LiDAR costs are coming down, so is the cost of radar systems. Both technologies are also poised to see large percentage growth and volumes reaching 40-50 million units by 2030. As the leader in Automotive Semiconductors, Advanced Driver Assistance Systems (ADAS), NXP offers a broad portfolio of Radar sensing and processing, Vision processing, Secure V2X and Sensor Fusion technologies that drive innovation in autonomous cars. See more on our web site.